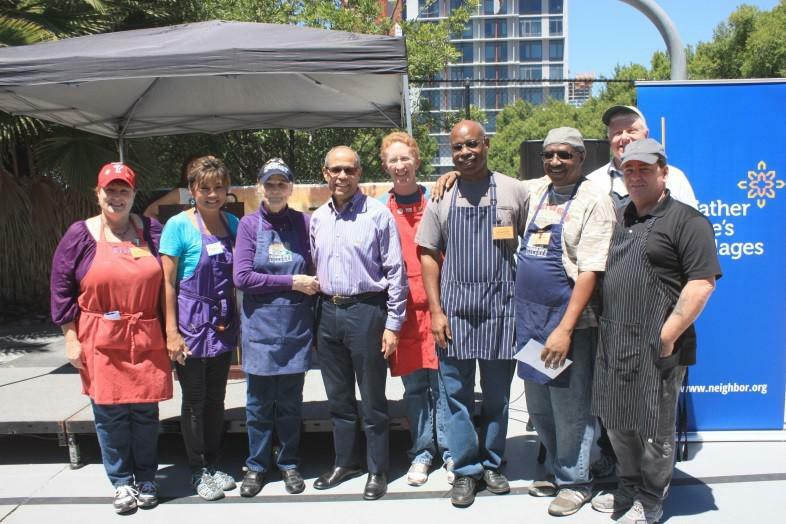 Father Joe’s Villages’ thanks volunteers with burgers, awards and heartfelt appreciation. The Father Joe’s Villages volunteers are the lifeblood of our homeless outreach programs. That’s why we love to celebrate them as much as we can. On May 20, we held our annual volunteer celebration to recognize the many volunteers who work to better the lives of individuals and families who are homeless at Father Joe’s Villages. We hosted several speakers, including our CEO and President Deacon Jim Vargas, Volunteer Services Program Manager Laura Kojima, and two Culinary Arts Program Graduates Ralph and Kelly. 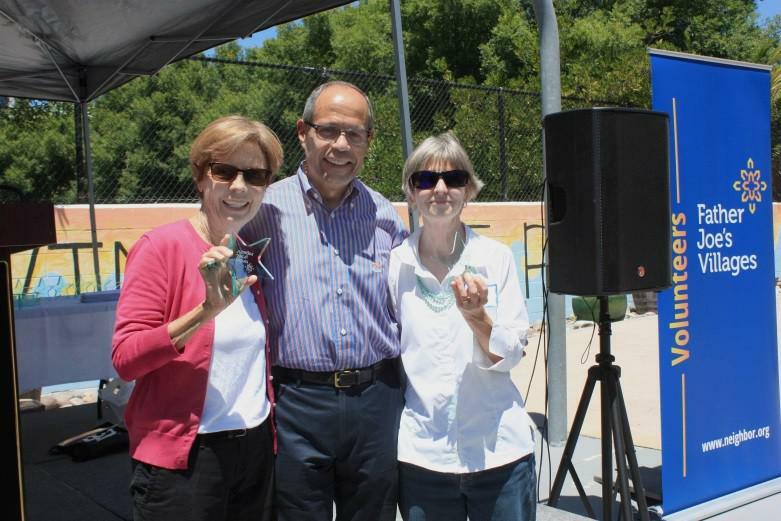 Fifteen volunteers received special awards for their dedication, time and talent. 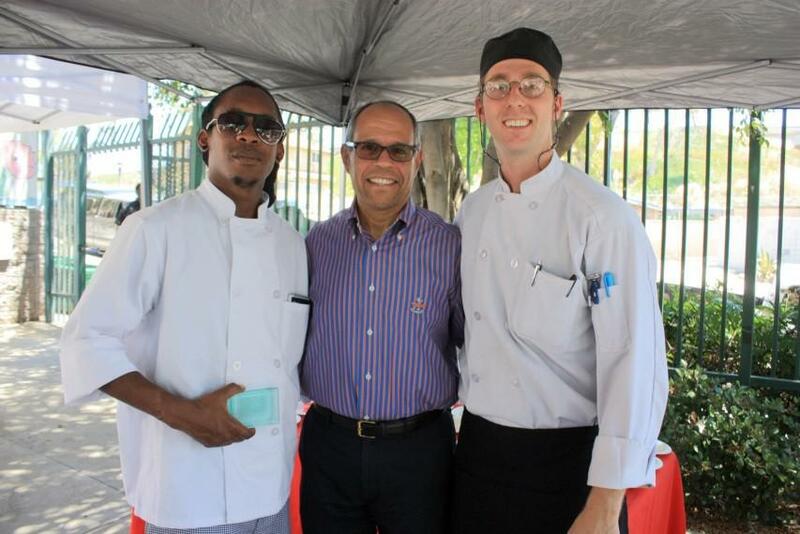 As an added benefit, we treated them to a barbecue and desserts prepared by the Culinary Arts Program. Laura opened the program, discussing the importance of volunteers at Father Joe’s Villages and the reasons why people volunteer. “Our success can’t happen without our army of volunteers. Did you know that we need 72 volunteers everyday just to serve meals? Many of you that serve in the kitchen… know that receiving a “thanks” or “bless you” means more than anything I can say today,” Laura said. As for the benefits of volunteering, Laura shared that giving one’s time to a good cause reduces stress, combats depression and provides a sense of purpose. The London School of Economics did a study measuring happiness in a large group of American adults and found that the more people volunteered, the happier they were. Compared with people who never volunteer, the odds of being happy rose 7 percent among those who volunteer monthly, 12 percent for people who volunteer every two weeks and 16 percent for those who volunteer ever week. Deacon Jim especially lauded the humility of volunteers to the crowd. “You don’t do it for accolades. You don’t do it for applause. You do it each and every day, each and every week to serve those who are vulnerable and those who are suffering and for that I thank you,” he said. Culinary Arts Program graduates Ralph and Kelly also wanted to share their gratitude for volunteers. “You gave your time, your blood, your sweat, and your tears to serve us… And for that I humbly thank you. It truly does take a village. How fitting that a place called Father Joe’s Villages demonstrates that ‘it takes a village,’” Kelly acknowledged. Ralph shared a similar sentiment during his speech. 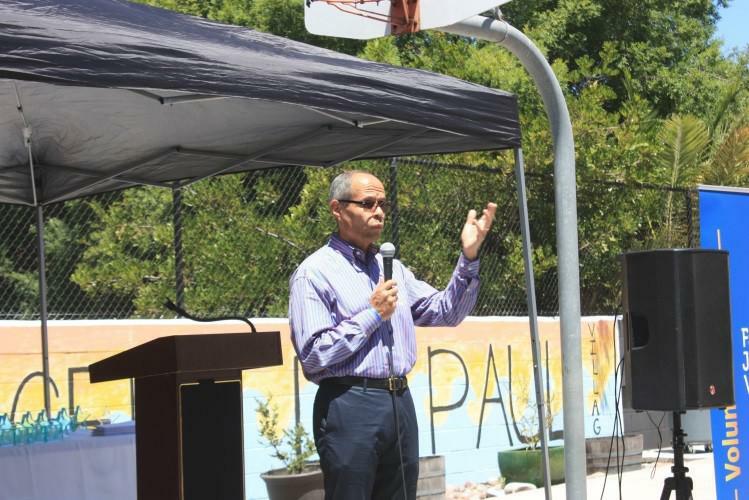 “[Volunteers] offer time, effort, patience, altruism and other values to reinforce community efforts to lead the struggle some citizens have found themselves in… I’ve been sheltered, nourished and educated because of you,” he said. Ralph and Kelly are just two of many individuals who have benefited from the programs and services made possible by volunteers. In 2016, Father Joe’s Villages help nearly 830 people achieve permanent housing and served nearly 1 million meals to our neighbors in need. This outcome is made possible by more than 10,000 volunteers who serve at Father Joe’s Villages each year in various capacities. They prep and serve meals in our dining rooms, help children learn to read at our Therapeutic Childcare Center, educate via specialized classes at our Employment and Education Center and offer hundreds of other services in our many programs. The event also honored members of our Ladies’ Guild, a volunteer organization that has assisted Father Joe’s Village, an all-volunteer group of approximately 250 women who raise funds dedicated solely to benefit the children at Father Joe’s Villages. Dottie Cunningham, our longest running volunteer and past Ladies’ Guild president, received an award, as well as Ann Link, the outgoing 2016-2017 Ladies’ Guild president. Father Joe’s Villages extends a warm and hearty thank you to all of the volunteers who help hundreds of people find their way home each year. If you would like to volunteer at Father Joe’s Villages and make all of San Diego shine, click here.